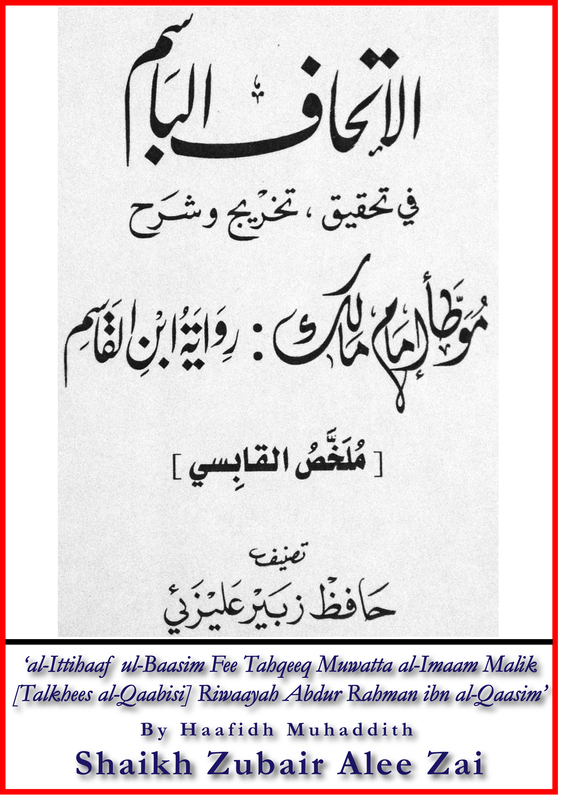 This book is an abridged version of Muwatta Imaam Maalik summarised by Abul Hasan Ali Ibn Muhammad Ibn Khalaf al-Ma’aafaree well known as Ibn al-Qaabisi with the additional grading of hadeeth, referencing and understanding of the hadeeth done by Shaykh Zubair Ali Zai. The transmission is via Abdur Rahmaan Ibn al-Qaasim al-Misree’s narration who is a famous student of Imaam Maalik (another famous student being Yahya Ibn Yahya). It only has marfoo and connected hadeeth. In this abridged version all of the hadeeth are either Saheeh or hasan except 1 narration which is daeef ie weak according to Shaikh Zubairs grading. The Muhaddith, the Haafidh Shaikh Abu Taahir Zubair Ali Zai has meticulously researched all of the Hadeeth, in doing so he has provided additional references for each hadeeth, the differences and variations in the wording, the grading of the ahadeeth and a comprehensive and succinct explanation of every hadeeth upon the understanding and methodology of the scholars of Ahlul Hadeeth Ahlus Sunnah Wal Jama’ah and thereby expounding the Fiqh of the hadeeth. Furthermore we pray and hope this manhaj of the Ahlul Hadeeth in explaining and extracting the benefits of the ahadeeth free the shackles of the muqallideen from their blind taqleed which they claim they dont do. The very same shackles that come on when anything pertaining to the deen is discussed and when the very same individuals are experts in filling out difficult and complex government claim forms. Let this also be a lesson to the ardent confused souls about the methodology of Ahlul Hadeeth and their historical approach to the Quraan and Hadeeth compared to the rayy methodology. Compiling some poxy list of hanafis disallowing taqleed shakshi hardly qualifies no matter how load or foul mouthed and individual or compiler is!!! Even if your are ghumnaam, badnaam or baymaan (Unknown, disparaged or deceptive) and they say sufficient is an indication to the intellectuals!! !